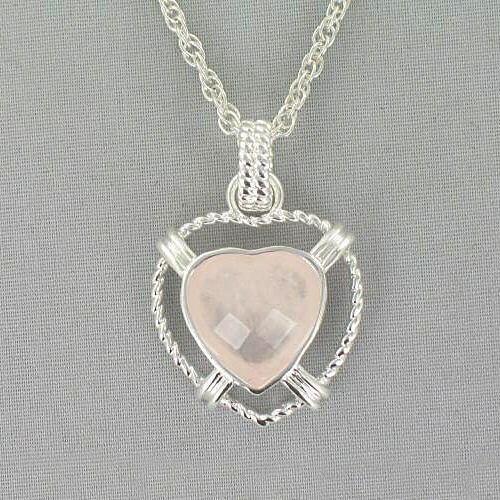 Any woman would be proud to wear this beautiful Silvertone Heart Necklace that features a wonderful Checkerboard Rose Quarts Heart. She’ll look stunning each time she wears it. Express your heartfelt feelings for your wife or girlfriend by presenting her with this lovely necklace at any romantic occasion. This would make a beautiful anniversary gift! She will be putting on the glitz with this Checkerboard Rose Quartz Pendant Necklace. Perfect for celebrating any romantic occasion. This Silvertone Pendant Necklace is laced through an 18” rope chain with a lobster claw closure. Pendant measures 1 1/4" from the top of the bale to the bottom of the heart. Imported. Please note that this item may ship separately from the other items on your order. Please allow an additional 6 business days for production. Rush, Express and Urgent delivery is not available. Additional Details Shop our sophisticated collection of high quality Personalized Jewelry that is perfect for your special lady. Personalized Jewelry creates a romantic and thoughtful gift to celebrate any occasion. Be sure to also include one of our Personalized Valentine’s Day Teddy Bears to create a wonderful gift presentation.